This popular‏ deep-fried egg‏ roll is stuffed w/ silver thread noodles, cabbage, carrots, onion, earwood mushrooms & jicama. Not just another egg roll. Deep fried & stuffed w/ silver thread noodles, cabbage, carrots & ground beef. This deep fried egg roll comes stuffed w/ ground pork, silver thread noodles, jicama, onion, carrots, & egg. 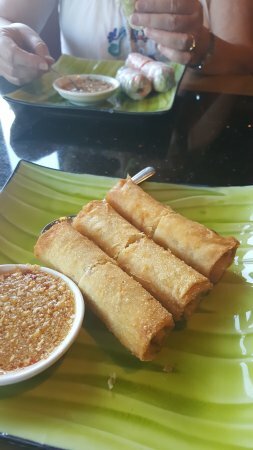 An egg roll lover’s favorite! The best spring roll in the twin cities! Fresh vegetables, noodles, shrimp & pork, wrapped in rice paper & served w/ a delicious, tangy sauce. Two per serving. The best spring roll in the twin cities made even better w/ lettuce, bean sprouts, carrots, cilantro, shrimp, pork, rice noodles & three different types of fresh mint wrapped in rice paper & served w/ delicious sauce, & always fresh! Marinated chicken or pork on a skewer, served w/ spicy peanut curry sauce & cucumber salad on the side. Very popular. Deep-fried chicken wings stuffed w/ ground pork, silver thread noodles, shiitake mushrooms, onion & water chestnuts. Deep-fried squid‏ stuffed with‏ ground pork, silver thread noodles, shiitake mushrooms, onion & water chestnuts. Delicately shell-shaped pastries, deep fried & filled w/ chicken, onion, potatoes & curry. (Subject to availability). Deep-fried tofu.‏ Served with‏ sweet & sour sauce. Wonton Soup – Pork, Chicken or Vegetarian. This popular deep-fried egg roll is stuffed w/ silver thread noodles, cabbage, carrots, onion, ear-wood mushrooms & jicama. Not just another egg roll. Fresh tofu, shitake mushrooms, onion, green onions, & coriander. A favorite w/ twin citians, this delivious lemon-flavored soup has straw mushrooms, lemon grass, galanga, kaffir lime leaves & Thai chili peppers. served w/ rice. Tender chicken in coconut milk w/ galanga, lemon grass, kaffir lime leaves, straw mushrooms & lime juice. Served w/ rice. Tender beef simmered in coconut milk, accompanied by a red curry paste, young bamboo shoots & sweet basil leaves. Chicken simmered in coconut milk accompanied by a red curry paste, young bamboo shoots & sweet basil leaves. Skinless roast duck sliced & simmered in coconut milk w/ red curry paste, peas, tomatoes, & sweet basil leaves. Orange roughie simmered in coconut milk, red currry paste, kaffir lime leaves & basil. Tofu & red curry in coconut milk w/ broccoli, carrots, green beans, napa cabbage, potatoes, pea pods, & jumbo onions. 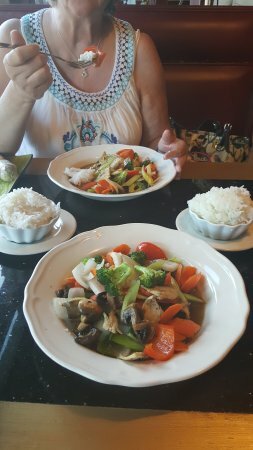 Another twin cities favorite, this traditional Thai dish features a mild peanut curry sauce over steamed spinach. Stir-fried jumbo shrimp w/ fresh ginger, onion, celery, carrots, green onions, & oyster sauce. Rice noodles, sliced beef & meatballs. Il cibo fresco è fantastica! Sapori deliziosi, luogo di zona, servizio cordiale, mi è piaciuto molto! Ho ancora gustare il cibo qui. Ricevi risposte dal personale della struttura Taste of Thailand e dai visitatori precedenti.